"A film of visual scope, of imaginative concept, of powerful content, written and directed by Ingmar ". Ingmar Bergmann’s masterpiece film about confronting death. Death comes to a knight upon his arrival from battle and attempts to take him away. The knight challenges Death to a chess match as the people around them are haunted by the plague. 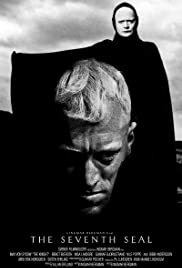 The Seventh Seal comes from a riddle about crusaders who arrive home after a few years to find their people affected by the plague.